Today the White House issued a proclamation that all U.S. flags are to be flown at half staff “as a mark of respect for the memory of Neil Armstrong” on the day of his burial. 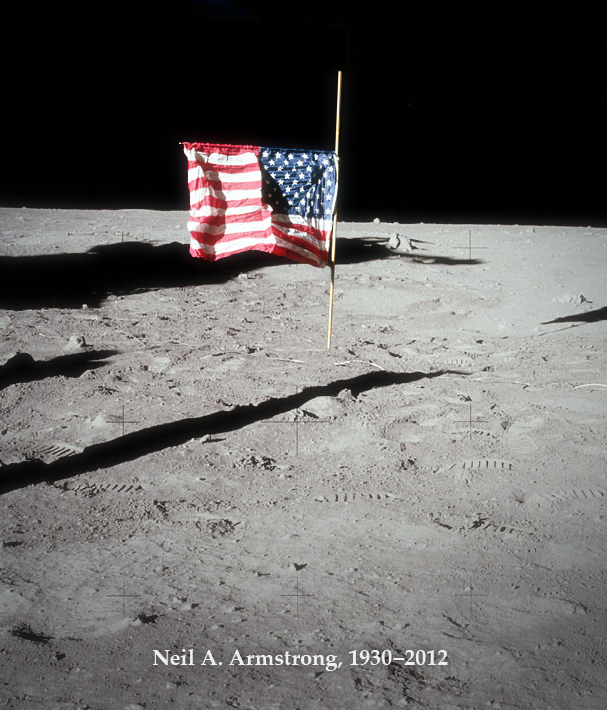 So, I made a little edit to an image of the flag planted by Armstrong and Aldrin at the Apollo 11 landing site. Were it still standing (which, sadly, it isn’t) and were there any likewise intrepid astronauts standing nearby when the proclamation was…er, proclaimed, this is what one might see shortly thereafter. The White House blog has also assembled a nice gallery of photos of America’s first man on the Moon. Check it out here. Godspeed, Mr. Armstrong. You may have been a “reluctant hero”, but you were a hero nonetheless. May we live up to your endeavors. he was a hero and deserves the salutations from us all… btw, you stunned me here, I follow and try to read about all astronomy as much as possible but I didn’t know that the flag wasn’t standing anymore on the moon, is that really true? The Apollo 11 flag was blown over by the launch of the ascent stage when Armstrong and Aldrin left. But most of the other Apollo mission flags are still standing… although it’s thought they may be pretty faded these days due to the extreme UV sunlight.